Northern Ireland's Leyland Tigers have now become as well known for their longevity as the previous RELL and Leopard models, and Translink operates the last large fleet of this type anywhere. The Tiger chassis has proven remarkably adaptable and a capable performer in roles as diverse as touring coach, rural bus and city service vehicle, and has shown itself to be every bit as durable as it's illustrious forebearers. The Trust already owns an early-model Leyland engined example (343 - DXI 3343), and has now purchased a Volvo engined example, 1315, which was presented to the Trust's Chairman at the 2010 Bus & Coach Rally. This bus carries one of the last of the Alexander N-type bodies, as production moved to the Cityliner type from fleet number 1340 onwards. 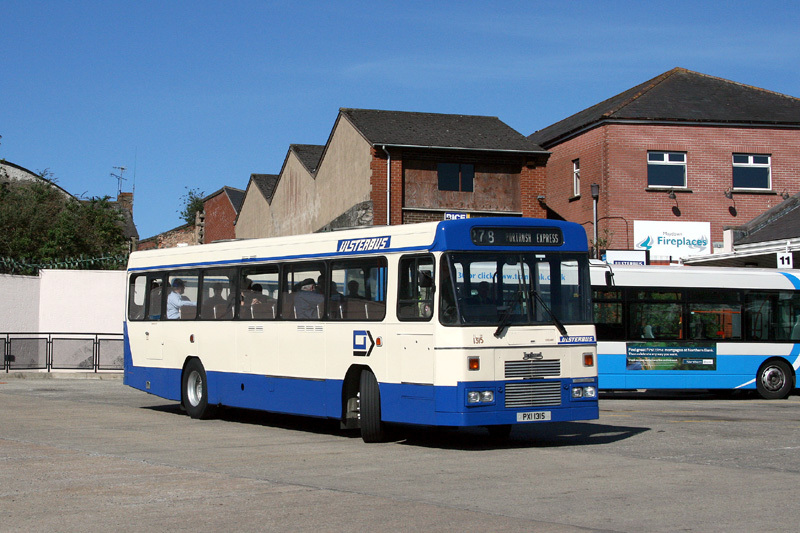 Once delivery of 460 Leyland engined N-types during the period 1984-1989 was completed Ulsterbus was no longer able to purchase it's preferred TL11 engine. After viewing a Tiger chassis with a Volvo DH10 engine at the 1987 Motor Show, management managed to persuade Volvo to offer this as a factory option for the Tiger model, married to the ZF automatic gearbox, in place of the previous pneumocyclic semi-automatic type. This combination resulted in a substantial order for 250 vehicles, for delivery during the years 1990-1992. 1315 was one of the initial batch production batch of 20 of these buses, 1301-20 (PXI 1301-20), which followed on from the prototype 1300. 1315 entered service at Coleraine depot on 1st February 1990 and ,as with 343, it spend the majority of it's life at it's original depot, only moving away from Coleraine to Newtownards in November 2009, where it continued to give service until the end of January 2010, it's 20th birthday. Notably 1315 carried a Leopard registration (AXI 315) during the period February to September 2006, in order to keep the number alive for use on an Ayats coach, but after this time it reverted back to it's original number PXI 1315.